The jackpot has reached $476 million, the biggest in U.S. history, and could go higher before Friday's drawing. It was quiet out there Wednesday morning, the day after the $363 million Mega Millions lottery jackpot had gone unclaimed. Too quiet. Joe Morales, supervisor at the Easy Mart convenience store on Oakland Road, looked around at the door, as if he were waiting for the stampede to begin again at any moment. During this jackpot run, he has already sold 300 tickets to one person. "Tuesday it was non-stop," Morales said, twitching slightly. "I haven't had any people today." State lottery officials announced the new jackpot for Friday's drawing is $500 million -- that's half a billion, the kind of dollars that usually only state legislators get to throw around. But in the calm before the coming storm, lottery players were mostly sitting on their wallets, waiting for The Biggest Lottery Ever Friday. When that day comes, one register at Easy Mart will be devoted exclusively to selling lottery tickets. Customers who want beef jerky will have to get in the other line. Of course, a ticket bought Wednesday is just as unlikely to be a winner as one bought the day of the drawing, but there was the psychology of the thing to consider. "One guy told me, 'I want to come in when the machine's hot,'" Morales said. "They believe all that. I'm like, 'You're not in Vegas, it's not a casino.' But that's what they want to do." Hector Quintero of San Jose stopped by the convenience store's lottery kiosk to fill out a Mega card with a series of numbers he was carefully transcribing from a fortune cookie. "These are my lucky numbers," he said, holding out the tiny ribbon of paper from a recent dinner at a Chinese restaurant. Not a regular player, he said he had just heard about the jumbo jackpot. "I wouldn't mind winning a couple of million dollars," Quintero said. And he would he feel about half a billion? "Even better." Regardless of whether a winner is found Friday, or the game goes on, the jackpot will be the biggest in human history. The largest Mega Millions payoff before now was $390 million, split by winners in Georgia and New Jersey in 2007. Spain has a jackpot game called El Gordo that pays $1 billion total, but that's split among several different prize winners, so its top prize wouldn't equal the potential Mega Millions payoff Friday night. "We're blazing an entirely new trail here," said California Lottery Commission spokesman Alex Traverso, "one paved with lottery tickets." 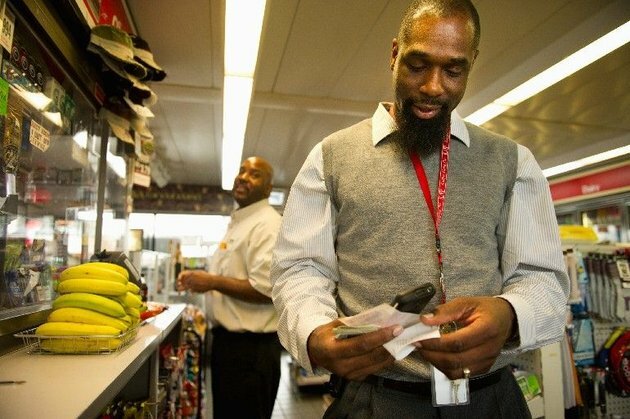 Tyron Carroll of Annapolis (left) and Lewis Wilborn of Hyattsville buy Mega Millions tickets at an Exxon gas station at Bladensburg Road and New York Avenue Northeast on Wednesday. Between the drawings last Friday and Tuesday, California sold more than $50 million in Mega Millions tickets. "You're talking about one and change for every person in the state," Traverso said. "I'm sure a few people are doing more than their share on that front." From a purely statistical standpoint, picking five of the six numbers required to produce a winning Mega Millions ticket is comparatively easy. 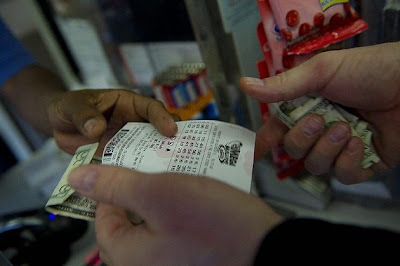 In Tuesday's drawing, no one got the $363 million jackpot, but 47 players nationally matched five out of six. The odds against matching all six are 1 in 176,000,000. To put that another way, if every man, woman and child in Pakistan -- the planet's sixth most populous nation -- went to their nearest convenience store and bought a Mega Millions ticket, only one of them would come up a winner. After nobody won the jackpot on Tuesday, the prize jumped to $500 million – a record high. NBC’s Kevin Tibbles reports. Primm Valley Lotto, a tiny store along the California border on the way to Las Vegas, is the top retailer among the 21,000 places you can buy a ticket in the state. Not wishing to divert the suckers from other ways to lose their money, Nevada doesn't have a state lottery. "As if there weren't enough else to do in Vegas," Traverso said, "but apparently there are people there just dying to buy lottery tickets." There was reportedly a two-hour wait in line to buy tickets at the store before Tuesday's drawing. San Jose's biggest lottery vendor is Dolce Espresso, a Vietnamese coffee shop on Tully Road, which ranks 28th statewide, and sells $4 million worth of tickets annually, according to manager Minh Nguyen. But the packed lunchtime crowd at Dolce Espresso Wednesday was glued to the cafe's big screen TVs, where soccer powerhouses AC Milan and Barcelona were playing to an electrifying 0-0 tie. "Saturday and Sunday were really busy," Nguyen said. "This Friday will be a lot of people. On Friday, they will hit all the stores." And that jackpot could keep growing. "I'm pretty confident it's going to go up again before Friday," Traverso said. "We don't have any comparable jackpots to relate this to. Everyone's trying to give a safe estimate of where the level should be, but as sales get higher and higher, I think that's probably going to push it beyond $500 million -- probably to $525 or $550."